27 July 2018, at 12:00a.m. It is important to take care of the birds that are received to ensure their welfare and to optimise the saleable product yield and quality during the process: carcass downgrading or condemnations can be very costly. The purpose of this article is to emphasise the importance of correctly addressing quality issues that may arise after the broilers have been received at the processing plant. Doing so will guarantee bird welfare, as well as a profit for the producer and a desirable end product for the consumer. After the birds arrive to the plant, they are typically weighed and placed in lairage. The lairage time should be less than 2-3 hours to prevent weight loss (shrinkage), and should provide protection from the sun, at a minimum, and be equipped with fans as well as evaporative cooling systems to maintain bird comfort and welfare. At this point in the process, extreme care and a high regard for bird welfare is needed to avoid injury and maintain carcass quality. The birds are either manually removed from the individual transport crates or drawers for shackling or unloaded mechanically by tilting transport modules onto a conveyor belt that transports them to the shackling area. In either case, care should be taken to avoid carcass damage (especially wings). The shackling area of the processing plant is one of the busiest in terms of labour due to the number of birds processed on a daily basis and the manual procedure of placing birds on the shackles. Employees must work quietly, calmly and efficiently to ensure that all birds are shackled properly while maintaining bird welfare. 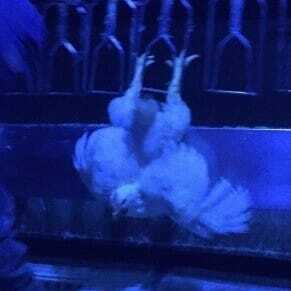 Broilers should always be handled with care by individuals who have been trained in the correct shackling techniques. Light levels in the shackling area of the processing plant should be kept low to keep birds calm. Under low light intensities, birds are calmer and less likely to become excited and accidentally injure themselves. Blue lights can also be used for the same purpose (Figure 1). Correct size and spacing of shackles for the weight of the birds processed can facilitate the process and reduce handling injuries. The time from the shackling area to the stunning cabinet should not exceed 60 seconds, and breast rubs should be utilised to keep birds calm. Stunning renders the bird unconscious and facilitates proper bleeding. Correct stunning ensures bird welfare and carcass and meat quality. Processing plants typically use water-bath electrical stunning or gas stunning; both are viewed positively from an animal welfare point of view. Electrical stunning systems vary, but electrical stunning is typically performed in the range of 12-150 milliamps (mA) of electrical current (alternating current (AC) or direct current (DC); varying in wave form and frequency) per bird for the duration of 2-11 seconds. Final meat quality and bird welfare may become compromised if the voltage, frequency and duration of application are not performed correctly. The depth of unconsciousness increases with increased voltage, but carcass quality may also be reduced. High voltages can cause wing and muscle haemorrhages. However, if the voltage is too low, birds may be rendered only partially unconscious and can become excited, leading to muscle tension and insufficient bleed-out. Carbon dioxide is the most common gas used for stunning. It is important for bird welfare that birds are gradually brought into contact with carbon dioxide. Gas stunning systems using other gases (oxygen, nitrogen and argon), as well as their combinations, have also been developed. With gas stunning, advice from qualified experts should be sought to determine the correct flow rate, concentration and gas or mixture of gases to use. Carcass damage can be a problem if the gas induction phase is not properly controlled. Correct neck cutting is integral to the speed and adequacy of the bleeding process. Bleeding is mostly a gravity-driven process that is time dependent. The recommended bleeding time is between 90 to 150 seconds. Poorly bled carcasses exhibit diffuse redness, which can lead to downgrading or condemnation of the whole carcass (Figure 2). Proper bleeding not only ensures carcass quality, but also significantly decreases the amount of blood in the scalder and drains, thus decreasing the organic load of the waste water. The purpose of scalding is to wet and loosen the feathers prior to de-feathering. Carcasses are immersed into hot water for approximately 1 to 3.5 minutes, depending on the type of scalding required. Most commonly, soft (52-54°C, 125-130°F) scalding temperatures are recommended for yellow skin (skin cuticle remains intact), and medium (55 -57°C, 131-135°F) or hard (54 -60°C, 130-140°F) scalding temperatures are used for white skin (cuticle removed), to achieve the desired skin colour. 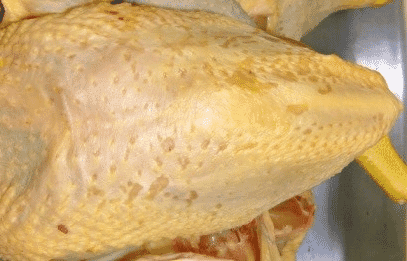 If the scalding temperature is not properly controlled, the skin colour may appear blotchy (uneven cuticle removal) or the breast fillets can have a “cooked” appearance (Figure 3). If the temperature is too low, it can cause “barking” or uneven removal of the skin cuticle (Figure 3). Proper agitation of the scald water (through the use of water pumps or addition of air pumped into the scald tank) ensures efficient wetting of the feathers. Multi-tank, counter-current flow scalders are very effective in the removal of dirt and organic matter from the carcass and ensures carcasses are progressively exposed to cleaner water. This practice is important in preventing cross-contamination. The rate of water flow should also be high (minimum of 1-2 litres per bird) to reduce organic build-up in the scalder tanks. The use of pre-scald washers and scrubbers has been effective in removing adhering faecal material on pelvic and pectoral feathers and preventing the faecal material that is typically expelled post-mortem from entering the scalders. After scalding, the birds immediately enter the de-feathering machines in which rotating disks with rubber fingers remove the feathers from the carcass. However, if the rubber fingers are not maintained in the de-feathering machines, improper feather removal and damage to the carcass can occur (broken wings, skin and muscle tears and carcass bruising). Any damaged, worn, broken and missing rubber fingers in the de-feathering machines should be replaced daily to assure a proper “break-in” period and that carcass damage does not occur. Multiple de-feathering machines (usually 3-6) are used to target and remove feathers in different parts of the carcass. After de-feathering, head and feet removal, and washing, carcasses are transferred to the evisceration shackles. Evisceration is one of the most critical points for preventing carcass contamination during processing. If the broilers have not had long enough to empty their digestive tract before processing and if there is viscera damage during evisceration, then the likelihood of carcasses contamination with the contents of the digestive tract is increased. Each step of evisceration, from the opening of the abdomen to viscera and crop removal, is critical and must be monitored continuously. Timely equipment maintenance and adjustments are extremely important to reduce and/or eliminate visible contamination. Carcass washers (using chlorine where allowed), strategically placed in points of likely contamination, are beneficial in terms of prompt removal of contamination. The harvesting of giblets (heart, liver, gizzard, and necks) is done following evisceration through either manual or automatic processes. Harvesting is again a critical area of contamination and cross-contamination that requires constant oversight. The extent of bacterial load on the final product is an extremely important parameter, in addition to continuous maintenance of the cold chain, in determining the shelf life of fresh poultry. The two most common methods of carcass chilling are water immersion and air chilling. Immersion chilling involves placing carcasses into a counter flow water system at 0-1°C (32-34°F) for 1.5 to 3 hours, depending on carcass weight. The aim is to reduce the deep muscle temperature to less than 4°C (40°F) to inhibit the growth of microorganisms. Where chlorine is allowed to be used, one of the key issues in water immersion chilling is to maintain a free chlorine level of about 5 ppm to reduce the likelihood of cross-contamination. 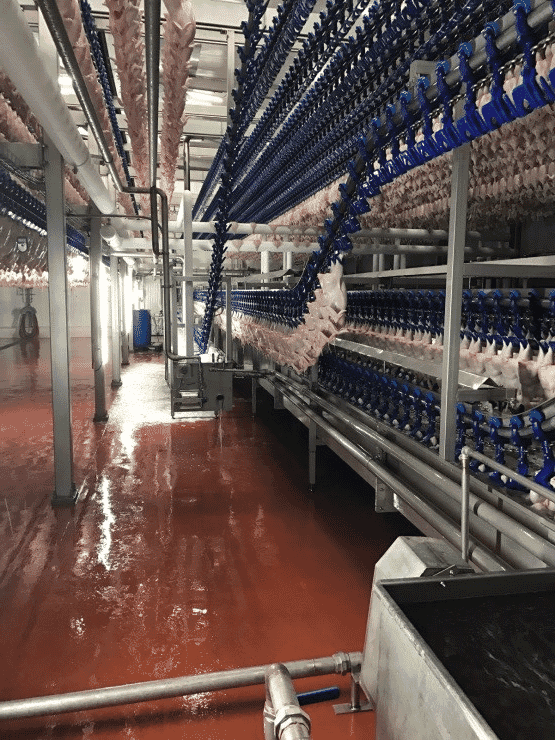 Maintaining this level can be difficult, since large numbers of birds entering the chiller introduce organic material that decreases the levels of free chlorine. Overflowing water chilling tanks with clean water (2-3 liters per bird) and using multi-stage counter current chilling systems can help reduce organic load. Another factor is the pH of the water. In areas where chlorine is allowed to be used, chlorine is more effective at or near a water pH of 6.5. Organic acids (ie, citric acid) are commonly used to acidify the water to enhance chlorine effectiveness. Air chilling systems are growing in popularity, partly because there is less water uptake of the carcass than with immersion chilling and the potential for cross contamination is reduced. Air chilling systems are characterised by chilling carcasses in environmentally controlled rooms with forced cold air. Because the rate of heat transfer is much slower with air than in water, it takes much longer to air chill. Recently, carcass chilling systems involving both water and air chilling have become available (Figure 4). The processing plant is the only profit centre in an integrated company! Process optimisation throughout the processing plant will have a positive impact on bird welfare, carcass quality, product safety, shelf life and profitability. It is important to understand, monitor and review all processing procedures regularly to ensure that they remain effective and sanitary, while maintaining bird welfare. This regular practice will help maintain optimal carcass quality, while decreasing carcass downgrades and providing the best possible product to the consumer. Bilgili, S.F. Addressing Carcass Quality Issues at the Processing Plant. Aviagen Brief, September 2016.